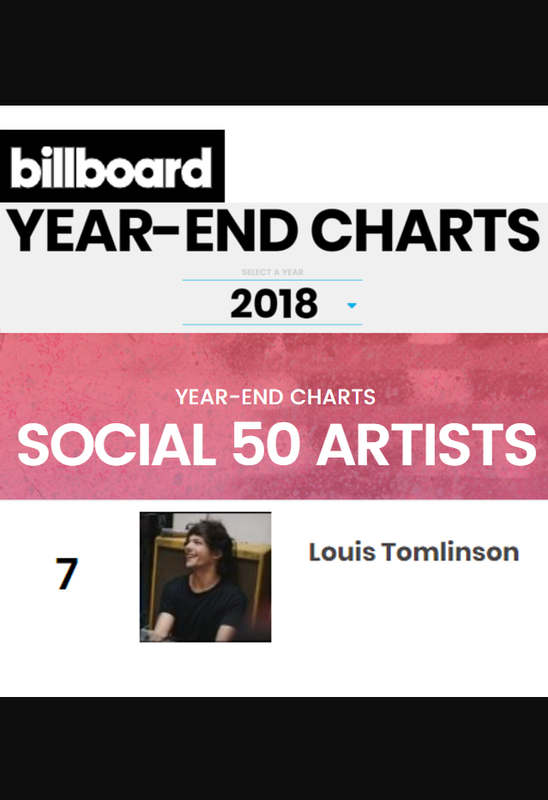 On December 4, Billboard released their annual charts for this year and Louis Tomlinson came in at #7 on the Social 50 chart. The Social 50 is a ranking of the most active artists on the world's leading social networking sites. Artists' popularity is determined by a formula blending their weekly additions of friends/fans/followers along with artist page views and weekly song plays, as measured by Next Big Sound. Louis, whose debut album is not even out yet, was topped only by BTS, EXO, Cardi B, Ariana Grande, Shawn Mendes, and GOT7 and beat out other artists such as MONSTA X, Camila Cabello, and Rihanna. With Louis confirming a single would be out this month (and his album likely to debut in the new year), 2019 looks to be the year to watch for LT1.